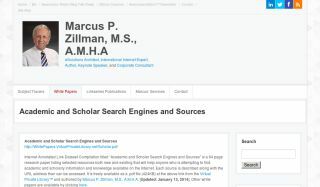 Internet Annotated Link Dataset Compilation titled "Academic and Scholar Search Engines and Sources" is now a 82 page research paper listing selected resources both new and existing that will help anyone who is attempting to find academic and scholarly information and knowledge available on the Internet. Each source is described along with the URL address than can be accessed. It is freely available as a .pdf file (549KB) at the above link from the Virtual Private Library™ and authored by Marcus P. Zillman, M.S., A.M.H.A. [Updated with all links validated and new URLs added: August 1, 2018]. Other white papers are available by clicking here.